We are very excited for each one of our Chesapeake Bible College & Seminary and believe that is an important and glorious time in Maryland at our Graduation for our Graduates. We understand that this is a milestone in our Graduates’ lives and we want to make this experience as meaningful as possible for them. Typically, Chesapeake Bible College & Seminary will connect with our Prospective Graduates and provide a Graduation Packet with specific information and forms connected to our Graduation events. 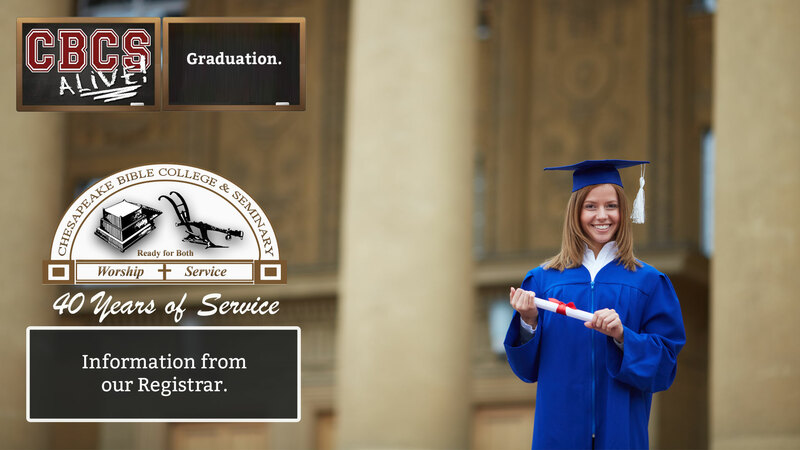 This is Graduation Packet typically includes a Graduation Questionnaire; Cap and Gown order forms; Picture order information; Graduation Accommodations Options including Hotel/Motel Information; Events & Commencement Schedule of Events; and a List of all fees to be paid in order to Graduate (outside of any Student outstanding balances). Feel free to reach our Academic Offices at (410) 634-9005 with any questions and or for further information. We are here to assist you in any way we can.